The year-over-year growth in commercial and industrial lending peaked several years ago and is now decelerating at a steady pace. That could be a warning sign for the economy, but it could just as easily turn out to be noise. Although bank credit is a critical factor economic modeling generally, as a practical matter this data tends to be unreliable for estimating recession risk in real time. 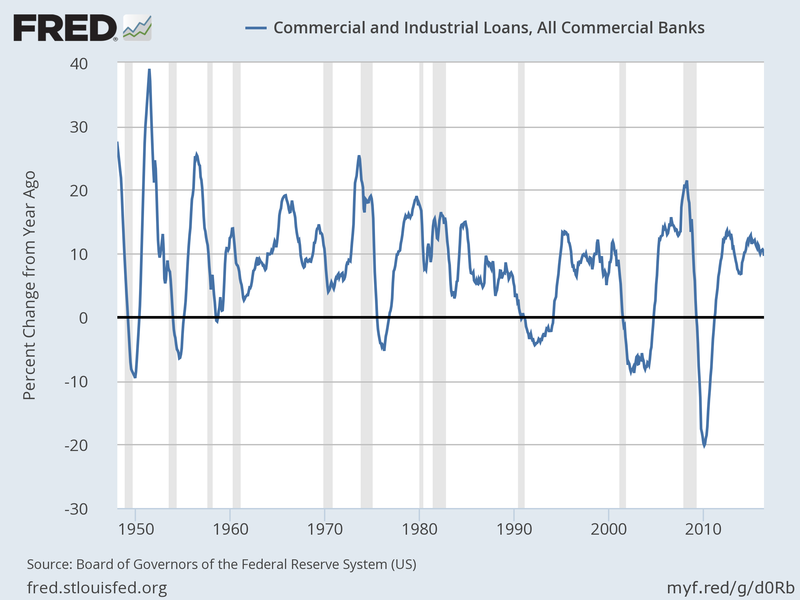 True, the growth rate of bank lending tends to slow and sometimes reverse during periods of economic contraction. But the tell-tale signs for this data have a habit of arriving well after the fact. That's a problem if the goal is developing reliable and timely warnings about macro risk. Consider the history of bank lending through the decades, based on year-over-year changes in commercial and industrial loans via Federal Reserve data. Although the trend often weakens in line with an economic slowdown, that's not universally true. In fact, the annual rate of lending growth sometimes accelerates during the early stages of NBER-defined recessions. Don't misunderstand: the credit cycle is a key variable for modeling recession risk. But doing so with bank loans isn't particularly productive. Yet, the sight of decelerating growth rates is too tempting a sight to pass up for some pundits. Cheery-picking indicators to rationalize a dramatic headline, however, is always a bad idea, and it's even more so if the indicator of choice is bank loans in the context of the broad macro trend. Fortunately, there are superior alternatives for monitoring credit factors in the task of estimating recession risk. Three indicators (out of 14 overall) do the heavy lifting on this score in the monthly business cycle profiles published by The Capital Spectator (and in the weekly updates of The US Business Cycle Risk Report): the Treasury yield curve, the high-yield bond spread, and the real monetary base (M0). Collectively, this trio captures the lion's share of the credit-cycle trend in a timely and relatively reliable manner. My research shows that adding bank lending data doesn't enhance the reliability and timeliness of the credit signal. In fact, there's a danger that adding business loans to the mix may be detrimental for developing timely warning signals about recession risk. One of the challenges with lending as it relates to modeling the macro trend is the slow-moving nature of the lending business. It's not atypical for lending activity to increase in the early stages of a recession, in part because contracts have been signed in previous months and the lending process rolls on. By the time banks have turned defensive, the recession is already underway. Identifying the onset of recessions isn't easy, even if you have a robust set of indicators. But it's a lot harder if you're using numbers with less-than-compelling histories for analyzing the economy's ebb and flow. Accordingly, it's essential to maintain a high standard for adding any one indicator to the mix. No single data set is perfect in the dark art of estimating recession risk, but some are worse than others. On that note, how does recession risk stack up these days? At the moment, it's quite low, as I advised in the current edition (March 12) of The US Business Cycle Risk Report. For instance, the Composite Recession Probability Index, which aggregates business cycle signals from several sources, is currently estimating a near-zero likelihood that an NBER-defined recession has started, based on data published to date. That's no assurance that recession risk will remain low for any length of time, which is why I monitor the macro trend closely, across a carefully selected and diversified range of economic indicators and business cycle indexes. Conspicuously absent from the list: business loans. 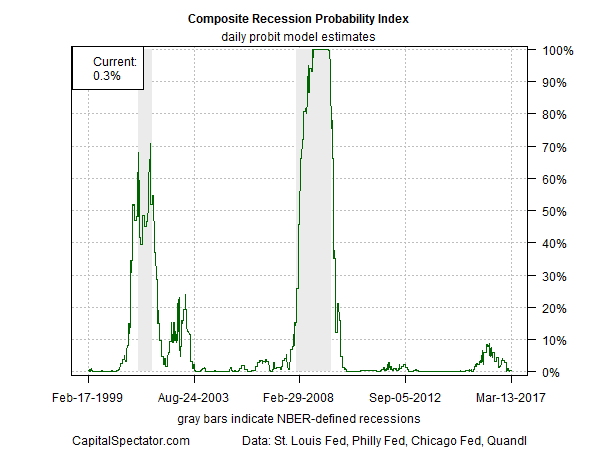 This is an important data set for some aspects of economic analysis, but real-time recession modeling isn't one of them.